The Don River basin is the northern most extent of the report card area, and covers 3,736 km2. It is home to the Don River, which flows to the west of Proserpine and empties into the GBRWHA north of Bowen. Approximately 4.7% of the basin by land area is part of a wetland system. Of this, 53% is estuarine , 16% is palustrine, 27.8% is riverine in nature and 3% is artificial or highly modified in nature. Over 80% of the basin is used for grazing, whilst 7 % is used for horticulture and only 1% for sugarcane. National Park and/or State forests occupy areas in the South-West (inland) area of the basin, as well as the Cape Upstart area. Within the basin 43 species of animal/plant are endemic to Queensland, whilst 26 species of plant/animal are rare or threatened, including the black-throated finch and the northern quoll. The Don basin includes the urban areas of Bowen and Merinda and the Port of Abbot Point. The area crosses two Local Government Areas: Burdekin to the north and Whitsunday to the south. Land use: Mixture- overwhelmingly grazing, with horticulture and a small amount of sugar cane. Approximately 11.1% of the basin by land area is part of a wetland system. Of this, 44% is estuarine, 23% is palustrine, 15.5% is riverine in nature and 15.4% is artificial or highly modified in nature. Within the basin 76 species of animal/plant are endemic to Queensland, whilst 42 species of plant/animal are rare or threatened, including the Proserpine rock wallaby and the Australian painted snipe. Sugarcane (17% of the basin) and grazing (51% of the basin) are the main agricultural activities present alongside some minor horticultural activity. 25% of the basin is made up of State Forests/National Parks. The Proserpine basin includes the urban areas of Proserpine and Airlie Beach and represents a significant tourism hotspot, with 45% of all tourism numbers from the GBR being concentrated into 0.1% of the marine park (the Whitsunday area). The basin is entirely within the Whitsunday Local Government Area. Land use: Mixture- grazing, sugar cane and a small amount of horticulture. Significant tourism use in the Airlie Beach area. The Pioneer River basin is the smallest basin (1, 490 km2) in the Mackay-Whitsunday Region. It has different catchment characteristics to the other four basins in that it has just one main channel, the Pioneer River, draining to the coast and that the bulk of the basin is inland. The Pioneer River basin is divided into four catchment management areas and flows into the receiving waters of Sandringham Bay. Approximately 4.4% of the Pioneer River basin is part of a wetland system. Of this, 61% are riverine systems, 25% are artificial and highly modified systems, 11% are estuarine systems and 2% are palustrine systems. Within the Pioneer River basin 67 species of plant and animal are endemic to Queensland. Fourteen vulnerable species, three endangered species and three critically endangered species exist. Two of the critically endangered species, the eastern curlew and curlew sandpiper, are migratory shorebirds that rely on coastal wetlands in the basin. The endangered Australian painted snipe also relies on wetlands throughout the basin. The City of Mackay is located at the coastal fringe of the basin and is the major urban centre of the Mackay-Whitsunday region. The basin extends into both the Mackay Regional Council and Isaac Regional Council local government areas. While the major land use in the basin is grazing, this is primarily in the upper, inland area of the basin. Sugarcane farming is the next major land use and this dominates the lower area of the basin. Forestry and conservation areas are the other major land uses that exist in the upper extent of the basin. Land use: Mixture- Grazing is main use in the upper catchment, sugarcane is the second major land use and is primarily in the lower catchment. Downstream monitoring on the O’Connell River. The O’Connell River basin covers 2, 387 km2 and encompasses the O’Connell and Andromache Rivers in the north and St Helens and Murray Creeks in the centre. These waterways discharge into Repulse Bay and the Seaforth Coast receiving waters. A distinctive feature of this basin is the number of protected areas it includes; 7 National Parks and 13 Conservation parks and State forests are captured in the basin, including Cape Hillsborough National Park and Cathu State Forest. Approximately 7.2% of the O’Connell River basin is part of a wetland system. Of this, 17.6% are riverine systems, 3.1% are artificial and highly modified systems, 75.1% are estuarine systems and 4% are palustrine systems. Within the O’Connell River basin 83 species of plant and animal are endemic to Queensland. Fourteen vulnerable species, six endangered species and two critically endangered species exist. The two critically endangered species are the eastern curlew and curlew sandpiper. Both are migratory shorebirds that rely on coastal wetlands in the basin. The endangered Proserpine rock-wallaby is also found in the area. The basin extends into both the Whitsunday Regional Council and the Mackay Regional Council local government areas, with the southern boundary of the basin encompassing the city of Mackay’s Northern Beaches area. The major land use in the basin is grazing, which is primarily in the north, followed by conservation and forestry in the upper reaches of the catchment, and sugarcane farming in the south. Land use: Mixture- grazing is major land use, followed by conservation in the upper catchment, sugarcane and forestry. The Plane Creek basin is unique in that it encompasses a number of smaller waterways over its 2, 538 km2 area, rather than one or two larger rivers like the other basins in the Mackay-Whitsunday Region. The basin includes Sandy Creek in the north and extends south to include Plane, Rocky Dam, Cape, Marion, Flaggy Rock and Carmila Creeks, which drain into Sarina Inlet, Ince Bay and Carmila Coast receiving waters. The basin is bordered by the Connors Range in the west. Approximately 11% of the Plane Creek basin is part of a wetland system. Of this, 17.3% are riverine systems, 6.1% are artificial and highly modified systems, 67.2% are estuarine systems and 9.4% are palustrine systems. 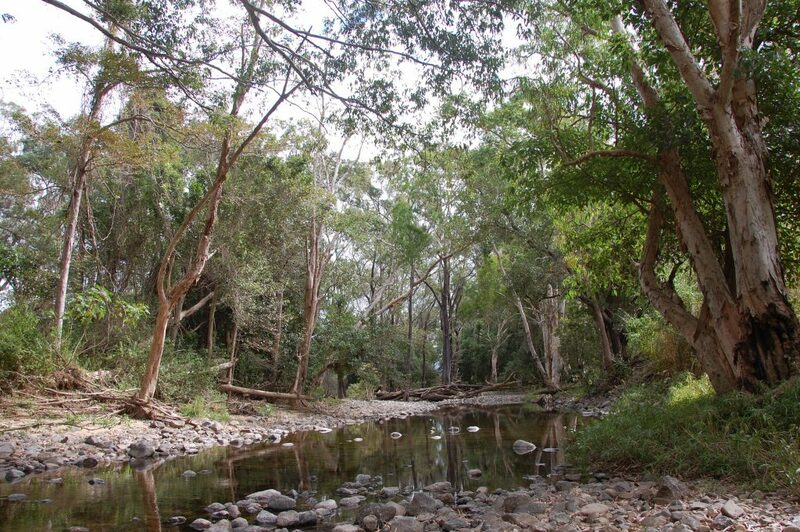 Within the Plane Creek basin, 33 species of plant and animal are endemic to Queensland. Nine vulnerable species, four endangered species and three critically endangered species exist in the area. Two of the critically endangered species, the eastern curlew and curlew sandpiper, are migratory shorebirds that rely on coastal wetlands. The endangered northern quoll is also found in the area. The major township of Sarina is situated on the lower part of Plane Creek and the basin includes both the Mackay Regional Council and Isaac Regional Council local government areas. While the major land use in the basin is grazing, the Plane Creek basin has the highest area of sugarcane farming across the Mackay-Whitsunday Region, which is primarily in the north of the basin. There are also small areas of forestry and conservation in the basin. Land use: Mixture- grazing in the south is the major land use, closely followed by sugarcane farming in the north. The Plane basin has the most sugarcane farming in all of the Mackay-Whitsunday region. There is also a small amount of forestry and conservation. Major rivers: Sandy Creek, Plane Creek, Rocky Dam Creek, Cape Creek, Marion Creek, Flaggy Rock Creek, and Carmila Creek.